Pro Grade Power that Packs a Powerful Punch! 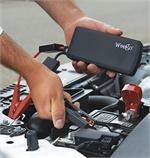 Weego JS18 is a 12V lithium-ion jump starter, powerful enough to easily start gas engines 6.4L and over and diesel engines up to 3.2L and still fit in your pocket or bag. 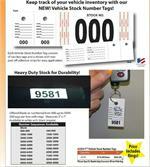 Available in Quantities from 125 to 2000 Or More. Customer Cards Are A Great Way To Show You Care. No Wind, No Worries, Your Message Is Always Readable. Durable 2 1/2 Foot Tall Fiberglass Pole With Wide Molded Clip That Easily Attaches To Any Car Or Truck Window. Printed On Both Sides. Sold Individually. 6 MM Hex Nut With Washer. 100 Per Box. Item # 1806. 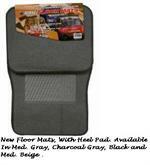 Odor & Mold Medicine, Odor Removal Made Easy. Each Kit Covers 200-300 Sq.ft. Removes Odors Permanently! Decontaminates & Deodorizes. New York State Registry Book, Spiral Bound for extra durability. 100 pages, 400 entries of purchases/sales records. Printed on one side of the page and the pages are pre-numbered. Three New Ways To Set Up Your Swooper Flag. 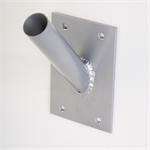 You Can Now Get A Fence Angle Base, Fence Straight Base Or A Trailer Hitch Base. 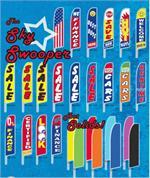 Swooper Flags Are Not For Just Automotive Dealers. You Can Use Them For Any Type Of Advertising. 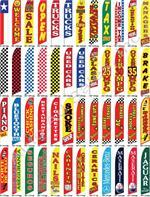 Custom Swooper Flags Are Available Also. 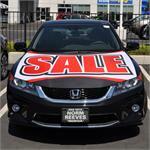 Please Call Us For A Quote! 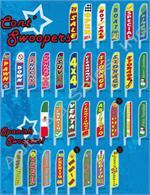 Swooper Flags Are A Great Way To Advertise. Can Be Seen By All Who Drive By You Lot Or Business! Standing 15 Ft Tall And Easy To Assemble These Flags Are The Way To Go. 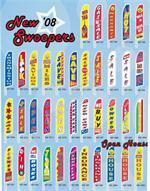 New Swooper Flag Designs For 2009. You're Sure To Find Something Here. Standing 15 Ft Tall These Vibrant Colors Cannot Be Ignored. Flags Sold Separately Or With Hardware. Watch your sales closing ratio increase with Today's Ups book. Follow-up is the key and with this book you track both walk-ins and phone-ins with organization and efficiency. One form: Front is for walk-ins and back is for phone-ins.